Meh. That about sums up my feelings for the holiday called Valentine's Day. Accordingly, I have half-assed some shimmery nails and slapped some hearts on to make it festive. I started with two coats of Seche, Calla Lily then added three coats of Color Club, Snow-Flakes. It's a very subtle flakey shimmer effect over the white polish. 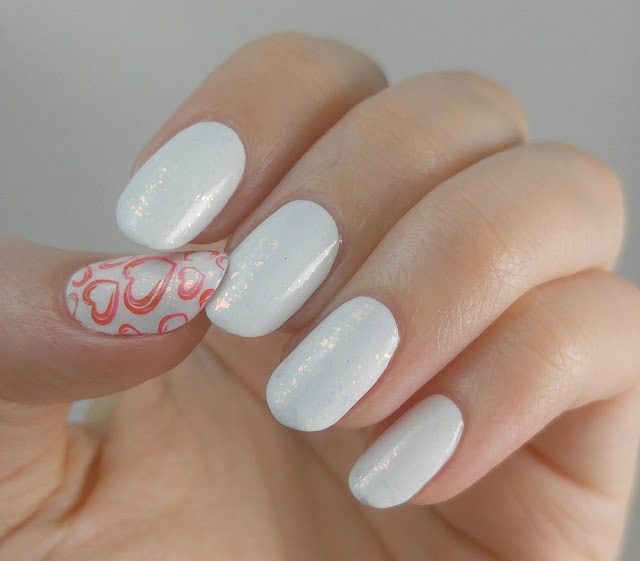 On my thumb I stamped some hearts using Bundle Monster plate BM-317 and Mundo de Unas pink and red stamping polishes dotted on randomly before scraping to give a two-tone look.